01/02/2018 Lesjöfors has for many years sponsored various student projects with products and know-how. Besides a good exposure of the product range it also presents Lesjöfors as a highly qualified employer. Lesjöfors is often a generous sponsor for Formula Student racecars. Formula Student is an annual international competition for student teams at technical universities from all over Europe. The teams design and build racecars “from scratch” and compete in different aspects such as driving characteristics, comfort, economy and performance. Many hours are spent on planning, construction, marketing and other preparations before the race. In 2017, the race was held on the prestigious Silverstone track in Great Britain. Among about 100 team, the Swedish Karlstad-based team Clear River Racing took an honorable third place. 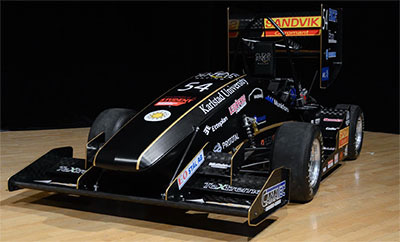 In the 2018 edition of Formula Student, Lesjöfors has sponsorship agreements with five Swedish universities; KTH, Lund, Linköping, Chalmers and Karlstad. The race is held August 6-12 2018 on the well-known Hockenheimring track in Germany. Lesjöfors´ sponsoring package includes springs for shock absorbers, technical support and standard springs. Lesjöfors see great advantages with sponsoring technical students; one thing is of course the exposure of the company´s springs in a global context, another is the opportunity the students´ get to use the high-quality products and learn more about spring development. “We see sponsorships as a great way to connect with new engineers for our group´s future headhunting needs. To get the opportunity to show our competence, wide capacity and high service level opens up for positive future cooperation, wherever the students will work in the future”, says Niklas Movitz, Key Account Manager and responsible for sponsorships at Lesjöfors Industrifjädrar in Herrljunga, Sweden.